Photographs can be a great distraction: enjoyable, sometimes surprising and inevitably stacked with memories. When recently ‘decluttering’ an attic full of memorabilia and photos it was difficult not to be become absorbed in looking at the old photos. Subsequently, I looked at my blog photo collection and found myself reminiscing about various Châteaux and wine related visits. Here are several photos that remind me of those times. Château La Dominique, Saint-Emilion: the new chai designed by architect Jean Nouvel. The Quintus Dragon, Château Quintus, Saint-Emilion. House of Bollinger – the original family home, Ay, Champagne. Every photo represents a story to me and I am grateful to many people for making these wine related visits possible. Happy Spring! Vancouver is looking beautiful in warm, sunny, springtime weather. I hope it’s similar wherever you are! What better way to spend time in Nature than to have a wine-tasting and walking holiday in the French countryside, in the Dordogne Valley near the small town of Bergerac? For time-out from the hurley-burley of city and work life, it would be difficult to find a better refuge for rejuvenating personal and family time. Within a defined radius around the communities of Saussignac, Monestier, Sigoules and Pomport, all within an easy drive of Bergerac Airport, there are many wineries where a visitor can happily indulge all three interests of Nature, Wine and Walking, or Randonnées as the French call walks in the countryside. Holidays in the French countryside often involve staying in self-catering Gites often attached to wineries. I’ve written in my blog about most of the wineries I am going to mention and will highlight the relevant blog posts. All the wineries offer wine tastings. In cases where I know the wineries offer accommodation I am mentioning this but not making any recommendations. Walking maps are available in the villages, usually in the Mairies (Mayor’s office) or on a notice board in public areas. Another resource is Walking in the Dordogne: Over 30 walks in Southwest France by Janette Norton, available on Amazon. Chateau Feely and Chateau Le Tap are adjoining wineries in this village. Both are organic wineries and both offer Gite accommodation. Three wine chateaux and a restaurant come to mind with respect to Monestier. Chateau Lestevenie, which I have mentioned several times in various blog posts, most recently in the December 2018, Soirée Vigneronne post. Chateau Lestevenie offer fun pop up dinners in the vineyard during the summer months. Sue and Humphrey Temperley can show you the variety of beautiful orchids growing on their property. It’s important to phone and book ahead for the popular (and delicious) pop up dinners. We have enjoyed many lunches at the Relais de Monestier restaurant, located in the centre of Monestier very near to the Chateau Monestier La Tour. Le Relais de Monestier is on Facebook. We have visited two wineries in this community, which is between Saussignac and Monbazillac. In the nearby village of Sigoules, the annual wine fair (Foire aux Vins de Sigoules) has been held here on the third weekend in July for over 40 years. It’s organized together with the annual gathering of the Confrerie du Raisin D’Or, which attracts many Confreries from all over France. 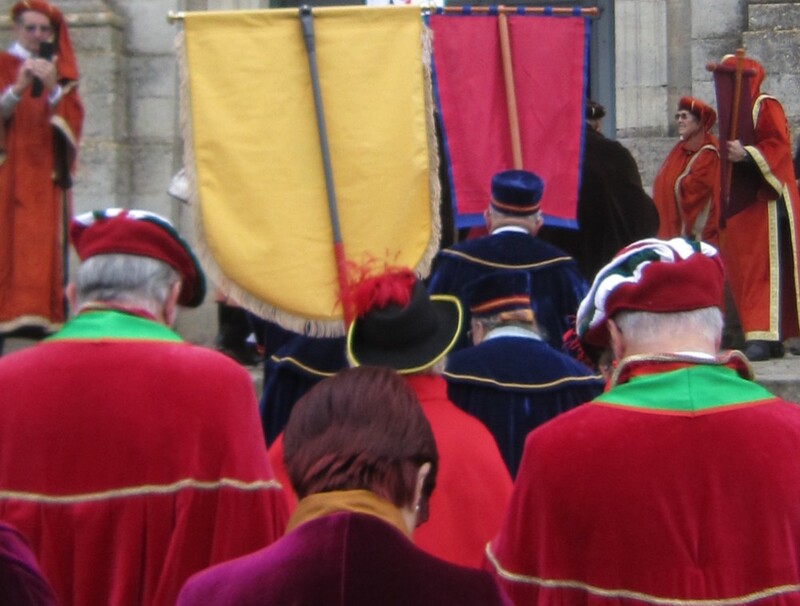 The confrerie members officially parade through the village on the Saturday morning in their charming and creative costumes symbolizing the gastronomique culture they represent. It’s a colourful and happy occasion held in the market square, near the Code-Bar and bistro frequented by many locals. Le Code Bar, Sigoules is on Facebook. There’s much more that can be written about the pleasures of this area: its proximity to the city of Bordeaux, the great wine areas of the Medoc and St. Emilion, the nearby route of the Santiago de Compostela pilgrimage, the historic sites of the 14th/ 15th Century 100 years war. There are the many food markets to tempt the visitor with local delicacies and kayaking on the Dordogne River to burn off calories. The list goes on and on. My focus here is about the opportunity for tranquility, for relaxing in nature, enjoying excellent local wine presented to the visitors by the wine-makers themselves in most situations and for walking among the vineyards and lanes of this peaceful, rural area; and, without doubt, rejoicing in the experience and having fun. The mysteries of technology! You may have seen an article pop up on my blog called A Sikh Presentation. It was in error and apologies for any confusion. I haven’t had the good fortune to go to India but maybe one day.